Sometimes when you are madly in love these are possible. Years later you look at the prints of your own lips and he saved them in a box. They come back across time, but you have forgotten. They become a series of little pink smiles. Years later you will do the book. The ground you cover won’t be pretty. 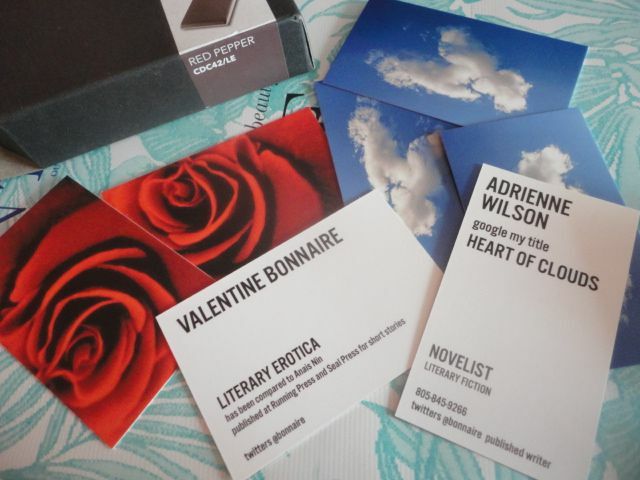 You are going to the Writer’s Conference, and you have your cards. They are shiny and new, and you’ll be holding yourself together to do a reading. How many years until you can tell it? The deep red roses blow open in a petal spill, each one furling apart and dropping themselves all over the floor around the vase, and she leaves them there and it takes a week before she’s going to see him again, but he’s coming up because he promised and she can almost hear him steering up the coast next to the sea, and her phone has been installed, and she’s given him the number, and so they have this fragile link that consists of love letters by mail to each other and little silvery prints, and this slim chord that carries their voices back and forth when they aren’t in each other’s arms. Their conversations run like whispers back and forth through little electrical wires that are strung for miles and miles in the sky over the landscape between them. And she’s driving and driving and so is he, and they are flying down the freeways and the rock lies just to the north of him and to the south of her and it’s halfway, and it will be where they go at first until she can move into her own apartment on Red Rose Way, in a place that they can really make love together. Where they can spent the whole night together, sometimes. The coast shimmers as she drives down, and he drives up, and they know where they are going. It’s the biggest rock besides Morro Bay, at the edges of Malibu and there are so many lonely and deserted beaches there, and they aren’t going to need anything except each other, and when she sees his white VW van already parked there; from a distance she begins to smile, like no smile she ever felt since because it was him, and she gets out and starts running from the other side of the parking lot, and then they are both running full force at each other, and she leaps and he catches her in his arms and she wraps her legs around his waist and they are spinning in circles, kissing, until they are dizzy with desire. Out to sea the fog bank hovered, and he said, “Let’s get in,” and he slid the door to the van open and there wasn’t anyone else there but the two of them, as the sun began to fall into the sea of afternoon, turning the sky the faintest rose-flushed peach. 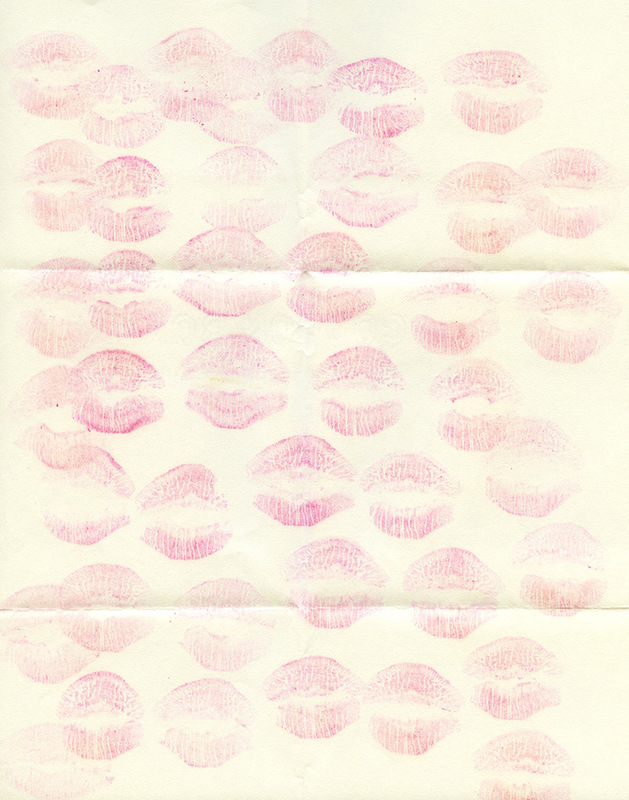 The words that you write around pink kisses are a snapshot of the time that so many years later came back to haunt you. 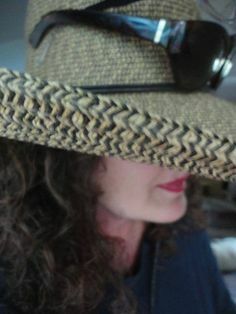 Posted in book, editing, excerpt, love, novel, old loves, reading, time, Writers, writing. Tagged book, excerpt, kisses, love, love affairs, lovers, novelist, Ocean, pink lipstick, red rose petals, Writers, writing.